I’d love to try to smoke a whole chicken at home one day, but well I took an easy way today and bought this little browned bird from the shop. To make the salad, I mixed shredded green cabbage, carrots, red onions and parsley, green salads with a tahini dressing. For the dressing, mix tahini paste, white wine vinegar and dijon mustard. 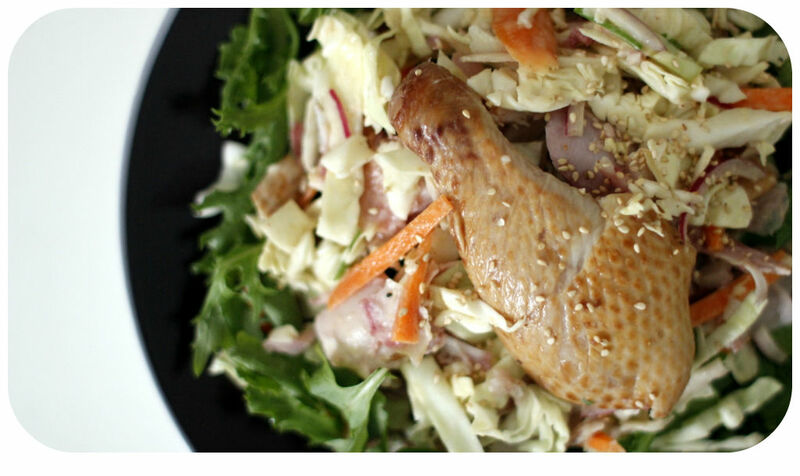 Shred the smoked chicken and mix well with the coleslaw salad. The smoky flavour from the chicken and refreshing crunchy salad marries very well. You can definitely cook your own chicken either grilling or poaching for a healthier option. Leftovers? Put in your lunch box! It will be a great filling for sandwich or wraps next day. Enjoy it in moderation because a cured or smoked meat contains a high amount of sodium and fat.